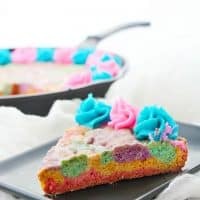 This tie dye unicorn skillet cookie recipe is the perfect spring or summer dessert and also works great for rainbow or unicorn parties! Make it in a cast iron skillet to deliver the perfect crispy edges and chewy inside! I am a sucker for any cookie with a crispy edge and chewy center. 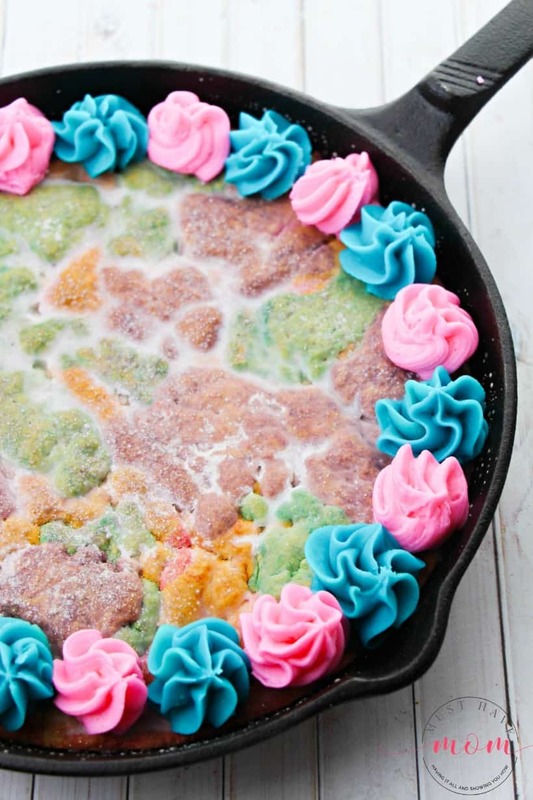 This tie dye unicorn skillet cookie delivers on taste and appearance. 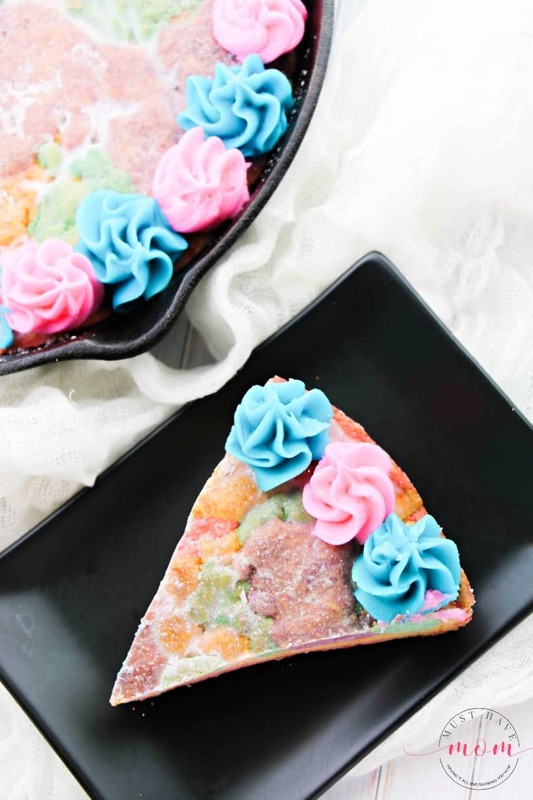 The colorful mashup is perfect for spring, summer or a rainbow themed party! 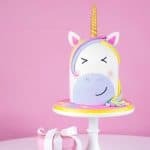 Unicorns are all the rage in the children’s party world and this dessert goes perfectly with unicorn themed parties as well! Scroll to the bottom of the post for the printer-friendly version of this recipe. 1 – Preheat oven to 350 degrees Fahrenheit. Grease a cast iron skillet and set aside. Stir together the flour, baking powder, baking soda and cornstarch in a small bowl. Set aside. 2 – Using a mixer, combine the butter and sugar together until light and fluffy, about 2 minutes. Add the egg, egg yolk and vanilla to the sugar-butter mixture and combine fully. Add in the dry ingredients and mix until thoroughly combined. 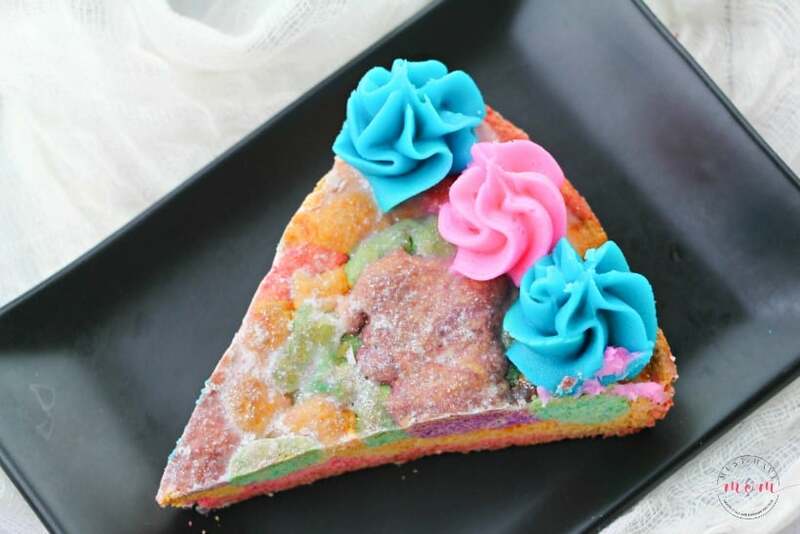 3 – Divide the dough into 4 equal balls and dye each with the food dye – one pink, one purple, one blue and one orange. 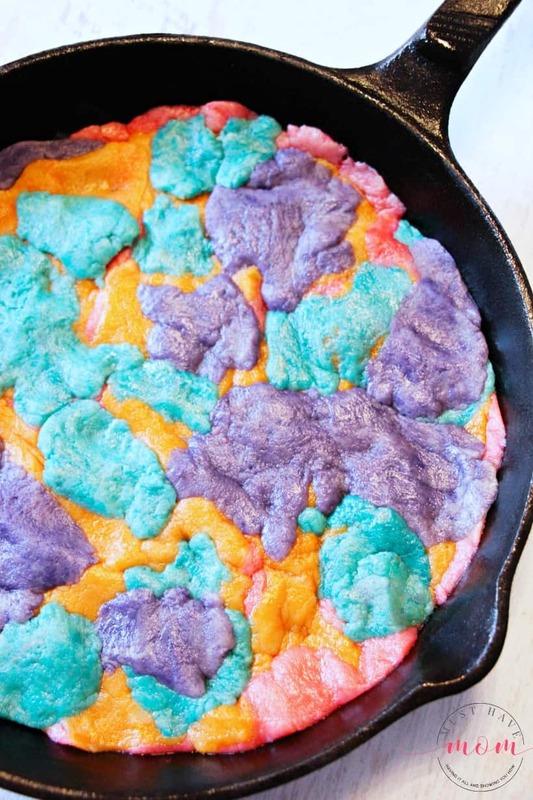 Either randomly add bits of dough all over the skillet or press down in layers. Press down the top of the cookie dough to ensure an even layer. 4 – Bake for 25-30 minutes until lightly golden on top. Remove from oven and let cool as you prepare the glaze and frosting. Combine the glaze ingredients and pour over the cookie. Generously add sprinkles. 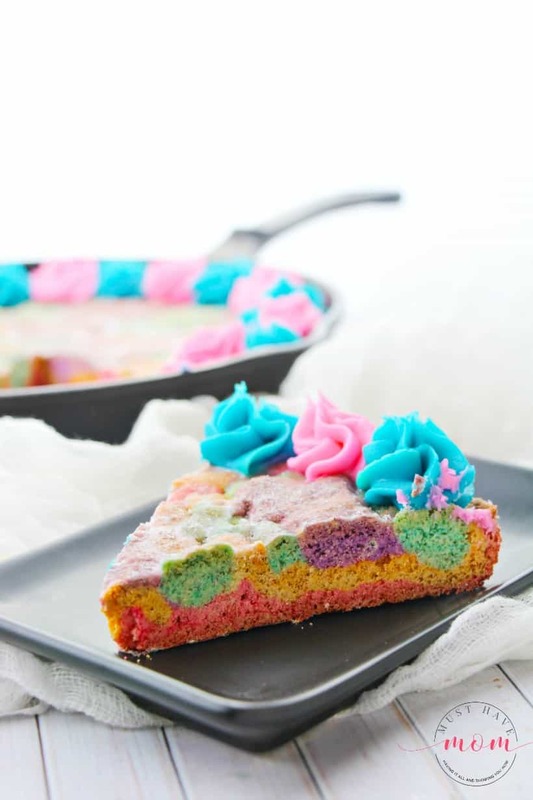 5 – In a medium-sized bowl, combine the butter, icing sugar and vanilla together for 1 minute until smooth, then add 1 Tablespoon milk and mix for 30 seconds. Adjust texture as needed with additional sugar or milk. Divide into two bowls and dye one bowl pink and the second blue. 6 – Scoop each frosting into a piping bag fit with a star tip. Make dollops of frosting along the edge of the cookie, making short 2″ swirls and pulling the piping bag back firmly. Using two piping bags makes this easier. Serve alone or with a big scoop of vanilla ice cream! 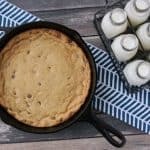 I love eating this skillet cookie warm, but it is also tasty when it is cool. Store any leftovers in an airtight container. 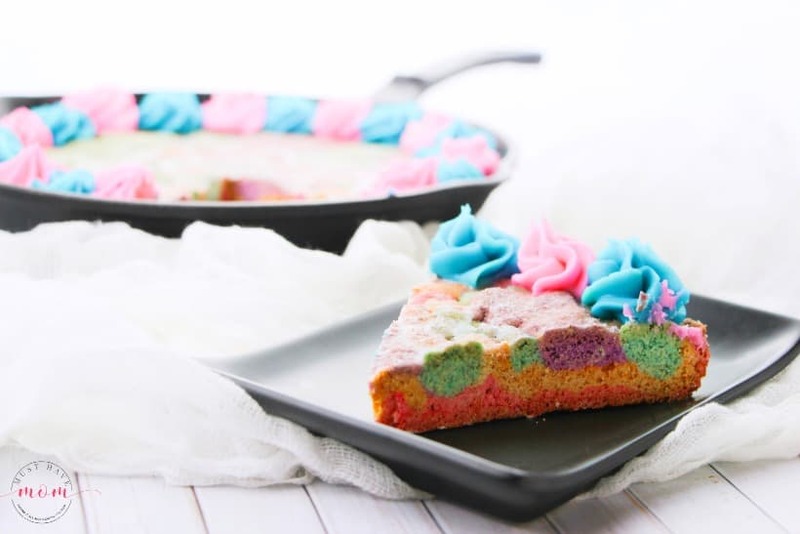 This fun tie dye skillet cookie is perfect for parties or a spring/summer dessert! Made in a cast iron skillet, this is a family favorite. Preheat oven to 350. Grease an iron skillet and set aside. Add the egg, egg yolk and vanilla to the sugar-butter mixture and combine fully. Add in the dry ingredients and mix until thoroughly combined. 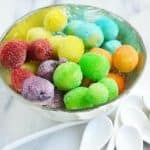 Divide the dough into 4 equal balls and dye each with the food dye - one pink, one purple, one blue and one orange. Either randomly add bits of dough all over the skillet or press down in layers. Press down the top of the cookie dough to ensure an even layer. Bake for 25-30 minutes until lightly golden on top. Remove from oven and let cool as you prepare the glaze and frosting. Combine the glaze ingredients and pour over the cookie. Generously add sprinkles. 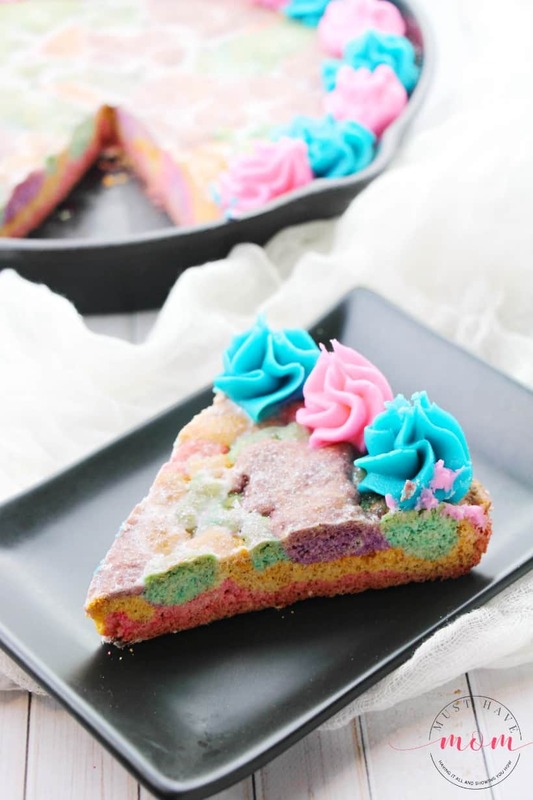 In a medium-sized bowl, combine the butter, icing sugar and vanilla together for 1 minute until smooth, then add 1 Tablespoon milk and mix for 30 seconds. Adjust texture as needed with additional sugar or milk. Divide into two bowls and dye one bowl pink and the second blue. Scoop each frosting into a piping bag fit with a star tip. Make dollops of frosting along the edge of the cookie, making short 2" swirls and pulling the piping bag back firmly. Using two piping bags makes this easier. « Great Wolf Lodge Bloomington, MN: Guide To Maximize Your Stay! This looks so cute & yummy! 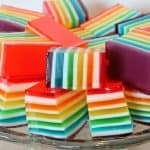 Perfect for a rainbow or unicorn party. Kids would just love all the colors. Thanks for sharing at Merry Monday. Hope to see you at the party next week! What a yummy dessert and it looks pretty too. Thanks! Yes, its’s so tasty too!